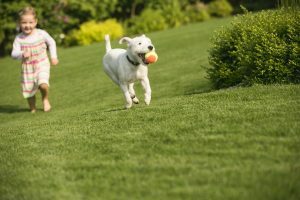 An invisible fence could be what your yard needs! An invisible fence can be a great addition to your property. If you decide you don’t want to go with a traditional wooden or metal fence, an invisible fence is another great option on the table. Here are just a few benefits an invisible fence can have for your property! If you are someone who likes to garden, you already know how frustrating it can be when animals come along and devour your prized plants. Maybe you have spent several weeks growing an assortment of vegetables in your garden. It is disheartening when you realize that a family of deer came through and ate everything in sight. Don’t allow this to happen and invest in an electric fence. It will do a great job at shielding your property from those pesky plant-eating critters! If you have a beautifully landscaped property, why hide it if you don’t need to? Maybe you are an individual who spends a lot of time working in the garden and wants all the neighbors to be able to see it. Many homeowners like this need a fence but do not want to block the outside view of their landscape. With an invisible fence, you receive the best of both worlds! One benefit of invisible fences that appeal to many homeowners is that they do not require a lot of maintenance. When you compare it to a traditional wooden fence, there is no painting, power washing, scrubbing or any other forms of upkeep. There isn’t much you need to do to your electric fence once it is installed other than reaping the benefits it provides to you. Are you a dog owner? If you are, an invisible fence could be what your property needs. You don’t have to worry about your loveable canine running away when you are not there. This entry was posted on Friday, September 1st, 2017 at 9:28 am. Both comments and pings are currently closed.